Back to school is in full swing for most districts and we know some teachers are already gearing up for their first Back to school night or open house for the 2013 - 2014 school year. 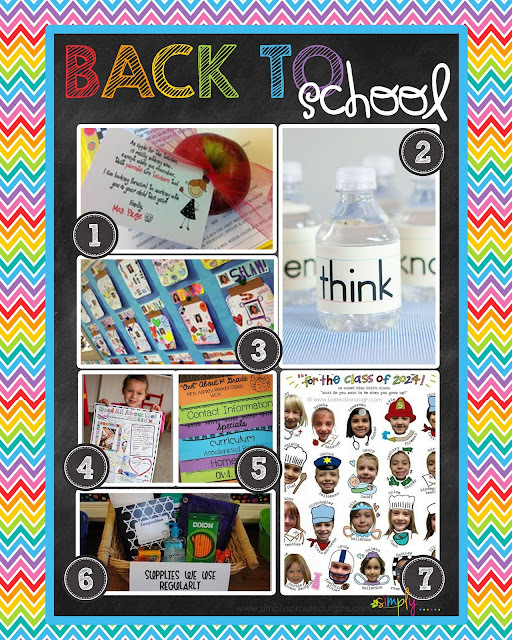 We found a few of our favorite items to make your back to school night extra special for your new group of parents. 1. This adorable poem and apple are a welcome treat as parents start filling out all of those beginning of the year forms. 2. Make your parents feel welcome and serve up some snacks, dress up your water bottles by wrapping them in sentence strips or sight words. 3. Have students create personal projects that express their individuality, these cute mason Jar posters are adorable for any age! 4. 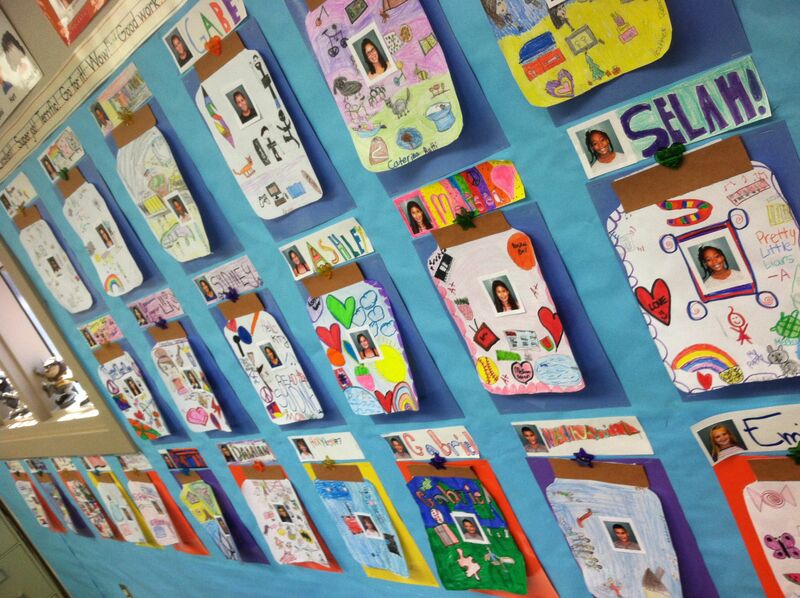 Student created all about me posters will brighten up those bare walls, encourage students to get creative while expressing their talents and style. 5. Use colorful paper to highlight different topics discussed during open house, see how these creative packets are assembled. 6. Highlight important supplies by displaying them so parents can clearly see what they should be looking for on those wal-mart shelves. 7. 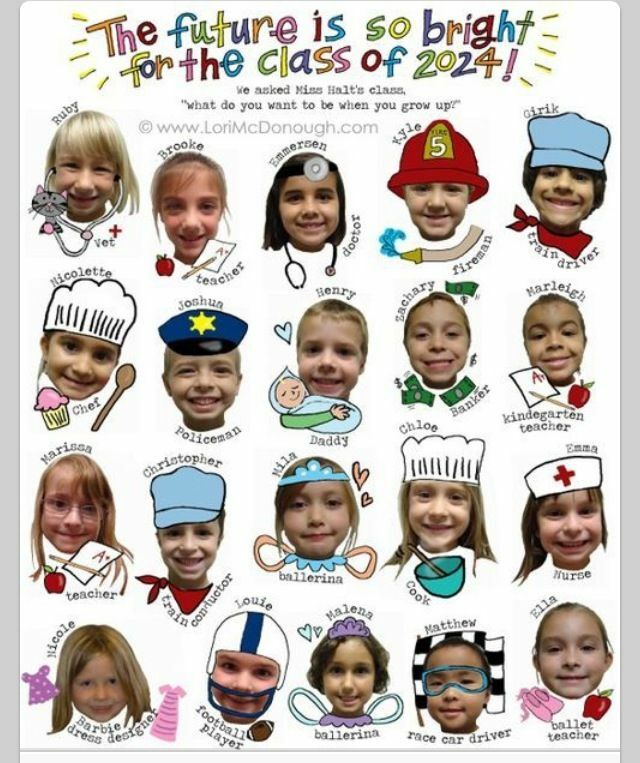 The beginning of the year is so hectic and crazy but remember to preserve those first day memories, take pictures to compare to the end of the year, create keepsakes like the one shown highlighting your newest crop of students and their aspirations for the future. Save time by using our Presentation kit, creatively designed to compliment any classroom just add your own info and you are all ready for Open house! Add a POP of color to your classroom with this colorful & creative Presentation kit for Open house night from simply sprout. 44 power point slides of resources, labels, signs and presentation slides for open house or back to school night. Whimsical birdies are combined with colorful chevron, polka dots and stripes in this adorable presentation kit, it will brighten up your back to school presentation! Make sure you make the most of your time with the parents during your open house. Here are a few of our favorite tips for a successful back to school night. Give parents important information and papers to fill out by placing them in a Ziploc bag at each students' desk. This ensures no missing forms and it's easy to send home for parents who can't attend. Print your presentation and handout for parents to look over at home. Make sure you have all of your volunteer sign up sheets out and any wish list items easily accessible to make sure the parents know how they can contribute to your classroom. Hand out magnets with your contact information and school website so parents can place on their fridge at home and use when they need to contact you. Wishing everyone a successful Open House!